A Look at the Evidence to Support the Use of Cannabis to Treat Trauma Symptoms. Welcome to our second Plantacea: Innovation Labs science feature! Last time the brilliant Dr. Deb Karhson looked at the relationship between cannabis and pain relief. You can find a copy of that article HERE. This time, we’re going to focus on Post Traumatic Stress Disorder, also known as PTSD, and cannabis. For those of you not familiar with PTSD, it is a psychological condition that affects roughly 7-8% of the population in the US (about 26 million people). Women experience PTSD at higher rates than men, which is startlingly but unfortunately not surprising when thinking about what experiences bring about symptoms of PTSD. The latest version of the Diagnostic and Statistical Manual (DSM-5), used by mental health professionals to classify and diagnose mental health conditions, states that PTSD arises when someone has been exposed to actual or threatened death, serious injury, or sexual violence. Sometimes, just witnessing these situations can bring about symptoms of PTSD. For example, first responders to an emergency situation (e.g. paramedics, firefighters, police) can develop symptoms of PTSD. Symptoms of PTSD include, but are not limited to, re-experiencing a traumatic event through upsetting memories, nightmares, and flashbacks. People who experience PTSD might have strong emotional distress or physical reactions to things that remind them of a traumatic event. Often there are attempts to avoid things related to the event, and there can be increased irritability, aggression, and anxiety. In fact, anxiety is such a big part of PTSD the old version of the DSM (DSM-4) classified PTSD as an anxiety disorder (in the DSM-5 it is classified as a “Trauma- and Stressor-Related Disorder”). This relationship between PTSD and anxiety is where the connection to cannabis may come in. I said earlier, “for those of your not familiar with PTSD” because I know that many people reading this article may already be familiar with PTSD. Over the course of the past few months I have had the privilege of meeting many of you at the Plantacea dispensary (formerly known as ReLeaf, located at 1 Benicia Road, Vallejo, CA #shamelessplug). On more than one occasion I have heard our customers say, almost word for word, that they have severe PTSD symptoms, that they have struggled to find a treatment that effectively manages their symptoms, and that cannabis is one of the few things that has given them significant relief. Given the seriousness of the symptoms described above, and how disruptive these symptoms can be for someone on a day-to-day, moment-to-moment, basis statements like these cannot be ignored. In fact, hearing testimonies like this from our customers has made me wonder how relevant a “scientific review” of cannabis as a treatment for PTSD is. For our customers, regardless of what the science says, cannabis helps manage their PTSD symptoms. Period. What the science can tell us, however, is how. The research article being reviewed this week was published in 2018 and is a review itself. That is, instead of just one study this article looks at a number of studies that have examined cannabis as a treatment for PTSD. The title of the article is called Cannabidiol as a Therapeutic Alternative for Post-traumatic Stress Disorder: From Bench Research to Confirmation in Human Trials and can be found HERE. It is a bit jargony, but a pretty interesting overview of some of the human and animal research on cannabis and PTSD. Wait, whaaaa??? Yes, I said animal research on cannabis and PTSD. Well, not PTSD directly. Let me explain. The endocannabinoid system is a biological system that exists within humans and other species. In fact, all animals have an endocannabinoid system (even ones that evolved over 600 million years ago). The endocannabinoid system has been called “the most important physiologic system involved in establishing and maintaining human health.” If this sounds familiar, that’s because this is the system that is responsible for the effects we experience from consuming cannabis. THC (or Δ9-tetrahydrocannabinol) and CBD (cannabidiol) found in cannabis plants are 2 of over 100 compounds called phytocannabinoids (or cannabinoids for short). Plantacea and many other cannabis dispensaries have cannabis products for pets. These cannabinoids interact with our brain and our entire nervous system, but particularly parts of our nervous system that are important for anxiety and aversive learning – or learning to avoid something that is bad. For example, eating rotten egg salad will probably make you avoid eating egg salad in the future. Or, watching Bird Box will probably make you avoid watching movies on Netflix in the future. So, parts of the brain associated with anxiety and aversive learning, like the amygdala and hippocampus, are impacted by cannabinoids and therefore cannabinoids affect things like learning and emotional processing. Once this was discovered, researchers were interested in cannabinoids and their role in emotionality, fear memory, and fear extinction, or learning to forget a fear response. This is where the animals come in. A few studies genetically engineered rodents to block the effects of cannabinoids in the brain and they found that the animals had a difficult time forgetting a trained fear response. Moreover, they found that when animals were able to forget a fear response cannabinoids were released into the brain. These findings support the idea that the endocannabinoid system is important for forgetting fear responses, and this system could be a promising target for disorders where fear responses are maintained or exaggerated. That is to say, the endocannabinoid system may play an important role in understanding and treating PTSD. Current medications for treating PTSD symptoms in humans (typically antidepressants and anxiolytics – or anti-anxiety medication) do not target the systems involved in fear memory or fear extinction, which may be why treatment of PTSD symptoms with these medications are not effective for some people. Estimates of how well antidepressant medication treats PTSD symptoms indicate that about 60% of people feel some improvement and less than 30% feel complete improvement of symptoms. That leaves 40-70% of people with PTSD symptoms untreated or undertreated. Thankfully, scientists have examined whether or not cannabinoids are effective at treating PTSD and there is evidence to support it as a treatment. For animals with symptoms similar to that of PTSD, treatment with cannabinoids reduces these symptoms. Roughly 7 animal studies have shown that CBD in particular was associated with helping fear extinction or reducing the formation of fear memories. Fewer studies have examined the use of CBD to treat PTSD symptoms in humans. Those that have show that CBD is associated with a reduction of PTSD symptoms, improved fear extinction, and in two case studies examined in the article, CBD reduced stress, anxiety, and improved sleep. Yeah, But Does Cannabis Work? Unfortunately, as many of you may have been expecting, the jury is still out on whether cannabis effectively treats PTSD symptoms. 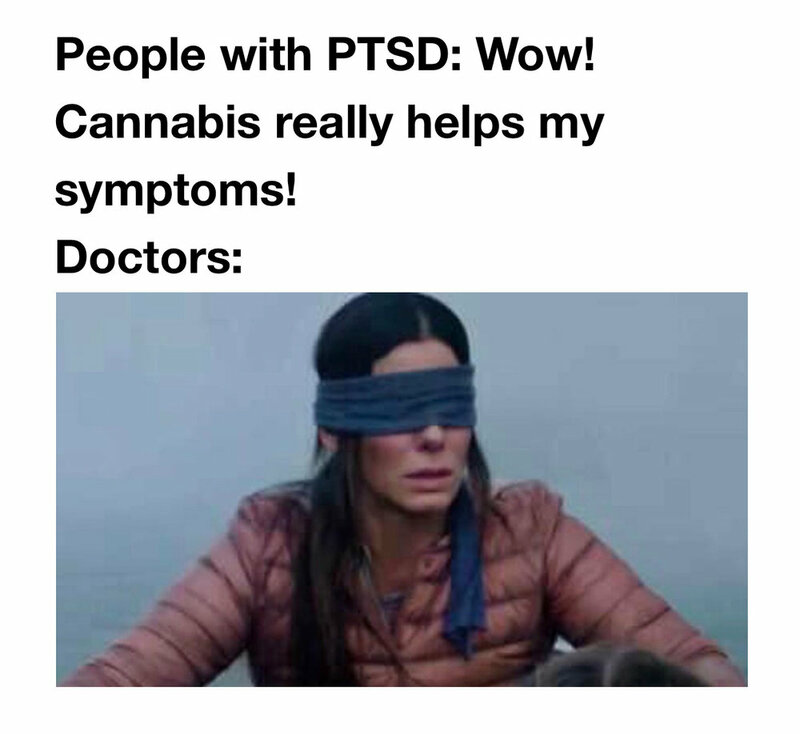 Or rather, there is evidence from animal and human studies demonstrating that cannabis does help treat PTSD symptoms, and it may do so through changing the way the brain processes fear and traumatic experiences, but there hasn’t been enough studies to recommend it as a treatment….yet. But given some of the promising work we have talked about in this article, and the experiences of many of our Plantacea customers, there is hope that cannabis and particularly CBD can be a physician recommended therapeutic alternative for PTSD symptoms in the future.